Mike Ullery | Miami Valley Today Steve P. Staley has been delivering smiles, as well as mail, to United States Postal Service customers for more than 40 years. PIQUA — A local postal employee is retiring after working 42 years at the U.S. Post Office in Piqua. Steve P. Staley, of Piqua, said it felt surreal to be retiring after working over 40 years with Piqua’s post office. Staley has been working at the same office, located at 220 N. Wayne St., throughout his career. “You meet all kinds of people,” Staley said. Staley, who has worked at the front counter for the majority of his career, said that he carried mail a couple of times, but winter convinced Staley to stay inside. When asked what his favorite part of his job was, Staley said that it was being able to interact with a lot of people. He said it was humbling to be remembered by a number of people in the community. Staley said that he tried to make his customers’ days brighter. “I’m going to miss waiting on a lot of them,” he said. Staley was born and raised in Piqua, and he graduated from Piqua Central High School in 1972. Staley and his wife, Cindy, have three adult children — Andy, Erica, and Derek — and 10 grandchildren. He and his wife met when Cindy was working at the Piqua Memorial Hospital. They will have been married for 42 years this April, as they got married two weeks after Staley first started working at the U.S. Post Office. Staley said that when he started in 1977, the U.S. Post Office did not have a lot of the technology that they do now. “There was nothing pre-sorted,” Staley said. They had to do more of the same work by hand, and he noted that they had a lot more people working at the U.S. Post Office at that time. Staley has worked under four postmasters, and he attributed many of his front desk skills to Paul Graham. Staley doesn’t know yet what retirement will bring him. “I’m just going to enjoy the time off and take what comes,” he said. 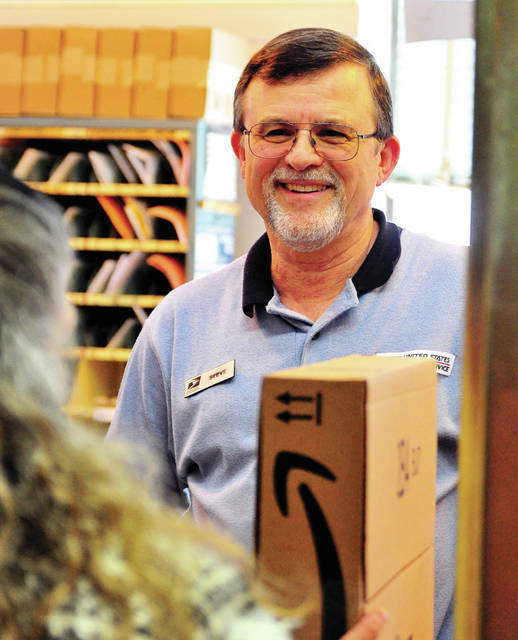 https://www.dailycall.com/wp-content/uploads/sites/30/2019/03/web1_032219mju_usps_stevestaley.jpgMike Ullery | Miami Valley Today Steve P. Staley has been delivering smiles, as well as mail, to United States Postal Service customers for more than 40 years.